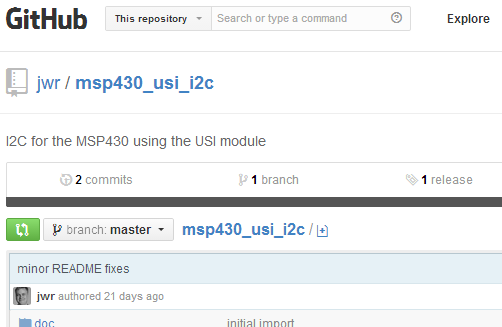 I’ve released a tiny library that implements I2C master functionality for MSP430 chips that have the USI module (MSP430G2412 or MSP430G2452 are ones that I use often). The code is on GitHub, it is MIT-licensed, so you can do whatever you want with it. This entry was posted on Thursday, January 30th, 2014 at 1:00 pm	and is filed under library, MSP430. You can follow any responses to this entry through the RSS 2.0 feed. You can skip to the end and leave a response. Pinging is currently not allowed.